ORLANDO, Florida – The terror threat facing today’s law enforcement and individuals charged with special event security is more sophisticated than in previous generations. Today’s terrorists can operate alone and/or in concert with an underground cell capable of causing immense destruction and devastation. And they can easily disappear … “not” just leave a neighborhood, but cross border states and flee a country. While the FBI and their law enforcement partners do what they can to ensure safety, it’s an informed proactive public making observations and recognizing suspicious circumstances that will be vital to thwarting the next attack. Situational awareness and a cooperating public … reporting unusual conditions that deviate from the norm … are law enforcement’s best chance to identify a threat and thwart the next attack. Looking for evidence of terrorism, individuals charged with special event security need to have a robust campaign reminding the public their safety requires vigilance. Terrorists usually engage in “telltale” betraying behaviors, prior to launching an attack. Not unlike a gambler who scratches his/her nose when making a “bluff,” these behaviors or “tells” are detectable. Being observant and/or familiar with your surroundings can be helpful to law enforcement. Terrorism experts suggest large venues should constantly run ad campaigns telling the public, “See something … say something.” Law enforcement people call it, “Situational Awareness.” Organizing and planning an attack, all terrorists leave “tells.” Taking a moment to analyze your surroundings, reporting things outside the norm, might be society’s best chance to thwart an attack. Unless the would-be terrorist conceals their tracks, someone skilled in “situational awareness” might very well detect their efforts. Anytime you have a publicized special event or soft target venue where authorities think the intent, motivation and capacity to inflict harm “exists” the public should be forewarned the threat level is “high.” To get the publics’ help they need to be informed about the threat. Alerting guests, giving them an active role in their security, exponentially makes a venue safer. Likewise, not having an established security plan, exponentially makes a venue less safe. Waiting for a terrorist to walk up to a venue wearing a suicide vest and/or flashing an AK47, authorities can only “react” to a threat versus implement a plan … leaving precious little time to resolve an incident safely. As discussed in my previous blog, a terrorism incident has an “immediate” detrimental impact on a company’s bottom line, bringing with it “not” only unwanted media attention, but dramatic economic consequences such as lost attendance and declining revenues. Proactive awareness and security planning done correctly mitigates impact. Planning for a high-profile event, security professionals need to combine liaison, LE intelligence, experience, technique and resources with pre-emptive procedures … all designed to mitigate the consequence of an attack. SURVEILLANCE – Investigators should be alert for individuals conducting illicit surveillance activities including reconnaissance, scouting, illicit surveillance logs, timing security rotations, observing operations, use of binoculars, cameras or maps in areas where they are not required, loitering for extended periods of time, clandestine surveillance activities and counter surveillance. INTELLIGENCE – Investigators should be alert for individuals conducting illicit intelligence gathering wanting to identify CCTV locations, including blind spots to avoid detection, photographing buildings for use in an attack identifying windows, doors, fences, delivery bay areas, parking lots and other significant infrastructure. Individuals seeking employment solely to monitor and report security activities at key locations. Individuals being unusually inquisitive about security practices. FUNDING – Investigators need to be alert for individuals conducting suspicious financial transactions, including deposits, withdrawals, use of pre-paid debit cards, numerous credit cards in different surnames, unexplained wire transfers or donation schemes meant to generate unusual sums of money which may be used to fund the purchase of explosive materials. SUSPICIOUS PERSONS, SIGNS OF TAMPERING, UNATTENDED VEHICLES / PACKAGES – Investigators need to be alert for individuals making repeated returns to the same site, by the same person; individuals loitering wearing unusually bulky clothing in hot humid weather; individuals loitering and displaying nervous demeanor; individuals acting suspiciously when approached by law enforcement or security personnel; tampering with air in takes for heating, ventilation and air conditioning units; vehicles illegally parked, particularly near large crowds, buildings, and places where guests gather in large numbers; unattended packages, backpacks and/or briefcases, particularly within a crowded area and/or walkway. TESTING SECURITY – Investigators need to be alert for individuals testing security operations, moving thru accessed controlled areas marked “off-limits,” observing security operations, or detecting perimeter flaws. Responding to an unattended package or backpack security personnel need to be aware of anyone watching their operations, analyzing response time and personnel. Security personnel need to challenge unauthorized persons in “employee only” designated areas, looking for individuals attempting to gain access to backstage areas and penetrate security. Likewise, investigators need to be alert for individuals making dry run rehearsals or practice runs at different times, wanting to learn travel time, monitor law enforcement response, and/or time traffic lights and/or speed limits. SITUATIONAL AWARENESS – Like the public investigators need to be alert for behavior, expressions and actions suggesting an attack. Awareness can thwart a terrorist incident. Recognition of these indicators can mean the difference between a catastrophe and a “stand down” transmission. PETER D. YACHMETZ is a 29-year veteran, retired FBI Agent with both private and corporate sector security experience. Classified as a subject matter expert (SME) in Physical Security & Access Control, Pete is well acquainted with all aspects of Field Intelligence [FI], Terrorism [T], Crisis Management [CM], Physical Security [PS], Special Event Security [SES], Corporate Security [CS] and Corporate Security Programs [CSP]. Pete has directed corporate security planning and operations, conducted security assessments [identifying exposures & vulnerabilities] and implemented proactive security protection measures [correcting site security vulnerabilities & access control deficiencies]. A plainclothes operative with the security complement of Walt Disney Company [WDC], Pete has also routinely monitored major security events. Applying established security measures, he regularly protected the company’s reputation and brand … all while ensuring guests, WDC cast members & company assets were safe and secured. He is also trained and experienced Behavioral Assessment Specialist. 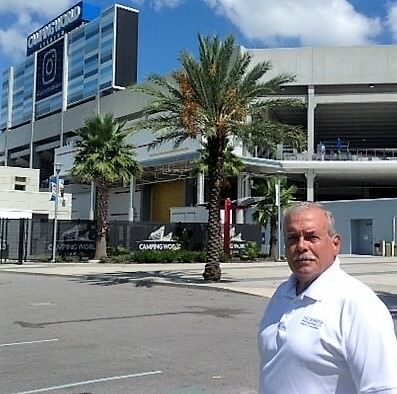 YACHMETZ CONSULTING GROUP LLC – Pete is a security & risk management consultant, providing both physical & facility security and major special event security planning. He also conducts Vulnerability Assessments [VA] and Due Diligence Screenings [DDS]. Pete’s specialized proactive security training and expertise, longtime law enforcement contacts and available resources make him the go to person company’s call seeking security and protection.